French Prime Minister Edouard Philippe announced that authorities will shut down Yellow Vests protests in Paris or any other French city if they determine that violent groups, intending to foment mayhem, are taking part in them. "From next Saturday, we will ban 'yellow vest' protests in neighbourhoods that have been the worst hit as soon as we see sign of the presence of radical groups and their intent to cause damage," he said. At the same time, France's prime minister announced that Paris chief of police Michel Delpuech, who has been in office since April 2017, will be replaced in light of the destruction that the Yellow Vest protesters committed on 16 March. Didier Lallement, the top police official from Nouvelle-Aquitaine, will be appointed new police chief on 20 March. Edouard Philippe also added that police on the ground will be granted more freedom to make decisions on the spot and given additional equipment, such as drones. French President Emmanuel Macron is considering banning all Yellow Vest protests from the Champs Elysees after protesters vandalized the famous restaurant Fouquet and several other establishments last weekend, an anonymous official from the president's office told Reuters earlier. 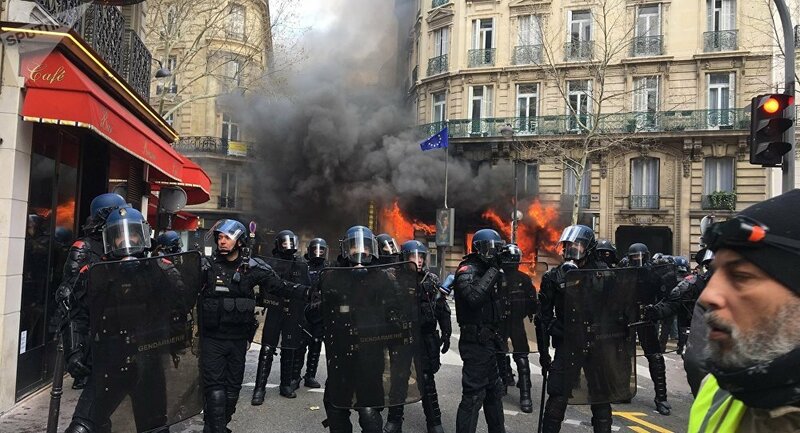 Macron called a meeting with the interior and justice ministers on 18 March in wake of acts of mass vandalism committed by some of the protesters on 16 March at the Champs Elysees. He promised to take "strong measures" in order to avoid similar acts next weekend. "What happened today at the Champs-Élysées is no longer a demonstration. These people want to destroy the Republic. Everyone who was there is complicit in what happened," Macron said in a tweet. France has been rocked by Yellow Vest protests for 18 weeks in a row after they began in November 2018 to fight the government's decision to raise fuel taxes. Although the government has since abandoned its plans and attempted to engage in dialogue with protesters, the Yellow Vests have expanded their list of demands, including Macron's resignation, among other things.